Instead of being concerned that you have no office, be concerned to think how you may fit yourself for office. Instead of being concerned that you are not known, see to the (be?) worthy of being known. Two weeks ago Mayor Dan Drew went to Washington DC to supposedly cement a deal to secure government surplus property on Mile Lane being offered by the Army to Middletown. This deal was first proposed by the Army to then Mayor Dominique Thornton, and later the deal was finalized by Mayor Sebastian Giuliano during his first of three terms in office. The site had minor environmental contamination, that by law had to be cleaned up by the U.S.Army before the could be turned over to the City. The City was to receive the property for free if it was to use it for a public use project. This is when, under the Giuliano administration, talks of a regional fire fighting training facility came to mind. Because of the small amount of contamination, and there being no extenuating circumstances requiring immediate clean-up because the level of contamination was never in flux, the project was basically on the bottom U.S. Army's to-do list, however, it was a done deal. Giuliano secured all the necessary paper work along side Rep. Rosa Delauro to keep the process moving and on the radar of the Army. In the opinion of the Insider, why on earth Mayor Dan Drew felt the need to spend "roughly" $1,000.00 of tax-payer funds to treat himself to a tour of Washington DC and dine in Foggy Bottom with Connecticut Representatives Delauro and Blumenthal in order to supposedly make a deal that was already in place and moving forward, albeit on the federal government's time frame, we just can't comprehend. The Insider wonders if Delauro had any sense of de va ju during the conversation about Mile Lane because she had previously worked on the transfer the first time around. 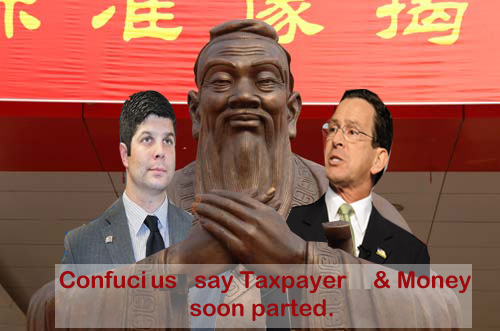 Mayor Dan Drew is packing his bags again, on the tax payer's dime, this time to rub elbows with the Chinese. Drew alongside Governor Dannel Malloy and a variety of esteemed technology professionals and experts will make the trip to China in the coming weeks. The list of professionals going to China is listed in an article published here: http://ct.typepad.com/ctc_blog/2012/03/back-to-shandong-province-opportunity-for-tech-firms.html. 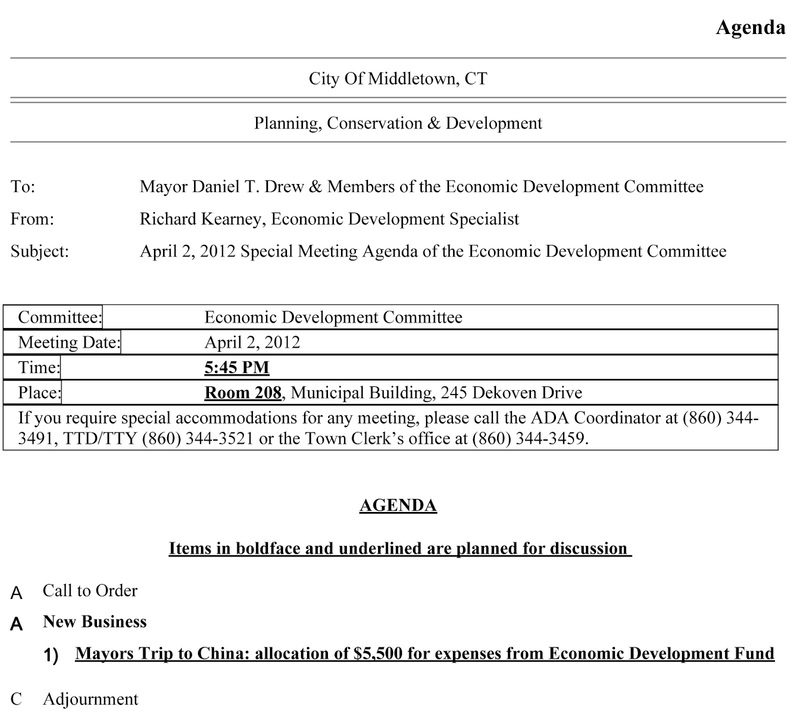 Earlier this week members of Middletown's Economic Development Committee received the agenda and on the agenda under new business was a request for $5,500.00 for the Mayor's trip to China. Minutes later, the an email was received telling members to disregard this email, and a new agenda would follow Friday. There is a line item for travel expenses for the Mayor, however, this cost would exceed this. During his campaign Drew complained of an LCD outside the Mayor's office that was paid for by grant (Home Land Security) money being something he felt was a waste of tax payer money. . Mayor Drew, while you are there maybe you can return the tvs in person because it was probably made in China anyway!! Last the Insider checked, the Connecticut River doesn't lead to the Yangzte, Hong Kong isn't on the Lady Catherine's route, and the mayor-mobile's ability to morf into a submarine is still being developed out at City Yard. In 1986 the State of Connecticut made the Shandong Educational exchange council to facilitate pen pal like relationships with K-12 schools in the Chinese province and the state, delegates have traditionally been teachers and superintendents (not mayors) participate in a 10 day sight seeing tour and work with foreign educators to facilitate lesson plans to promote each others' culture. I wonder if they have scream rooms in China? Since Middletown taxpayers recently gave Superintendent Michael Frechette over $300k to go away, I doubt a 10 day trip all expense paid is in the works. #1 How come Dan Drew is being considered a candidate to facilitate trade with Connecticut and the Chinese in the field of technology considering his back ground is in sports writing for a Virginia newspaper, and grant writing for Sacred Heart University prior to becoming a first term mayor of a small city less than six months ago? #2 Why are you the only mayor going amongst executives and technology experts? #3 If your bff Dannel wants to take the long route for take-out, why should the citizens of Middletown fund this? #4 While you are there Mayor Drew, can you bring back the jobs the U.S. government allowed manufacturing & technology businesses to outsource for cents on the dollar in recent years? We sorta miss 'em. The letter writer claims that further investigation revealed Drew to be a sports writer at the newspaper. Perhaps Mayor Drew is taking advice from Senator Richard Blumenthal these days a little too seriously; after all Blumenthal claimed during his campaign to be a Vietnam war veteran, and later blamed the media for misquoting him. , which later brought to light by the New York Times in 2010. Got something to say about this? 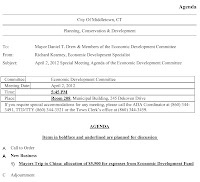 Middletown's Ecomomic Development Meeting is open to the public & meets at City Hall on April 2, 2012 at 5:45 pm in room 208.
can we pay for just the trip over and leave him there? Thank God I don't live in Middletown anymore. Drew was using Middletown as a stepping stone to become a full-time politician. If they citizens of our City didn't see it then - they should know it by now. They bought this guys BS, lock, stock, and barrel. Instead of staying home and worrying about a mult-million dollar deficeit in our own town, he's traveling all around on our dime to make a name for himself. We would like permission to use your article on The Queens View. Please email us at thequeensview@hotmail.com if this is acceptable. We think you have a very worthy story here. Thank you. Yeah don't forget all of the WesDems who gunned for this Mayor- thanks kids! how many of these things has Drew actually done? Auctioning off a tv paid for by grant money? What about his trip to dc and CHINA? Education? The Superintendent was sacked and you were in DC! Has Dan Drew posted why he is going on this trip, details? He did claim that he was going to jet around the world "selling" Middletown. What if he returns with some sweet opportunity for Middletown? One thing is for sure this ordeal about the LCD TV is ridiculous. I didn't know the TV was paid for with grant money. Now he is going to auction it off? He really enjoys using this TV thing as a symbol of his win. If he really wanted to save tax payer money he wouldn't drive the city car provided for him and take his own to work. Even better he could have drivin his own car to Washington D.C. Its a 7 hour drive.. Road Trip!! Thanks for updating with this information.